Well gang, here I am again, taking the Blog of Thog hostage for yet another one of my whacky musings. Don’t let my west of the Atlantic demeanor fool you folks, because I am after all here to sell you on a new ideology that will soon be taking the world by storm. What I am talking about folks is the newest, the greatest, the last thing you will ever need, and the first thing you will truly want. Yes folks this is the newest craze that can only come from your friends at Whacko Inc. Whatever can this crazy person be talking about? Well let me tell you in two simple words, Absolutely Nothing. Now that I have you desperately wanting to find out more about Absolutely Nothing, I must first give you a demonstration! You see it doesn’t slice, it doesn’t dice, it doesn’t make a sound, no, you see this new craze doesn’t go fast, slow, up or down. 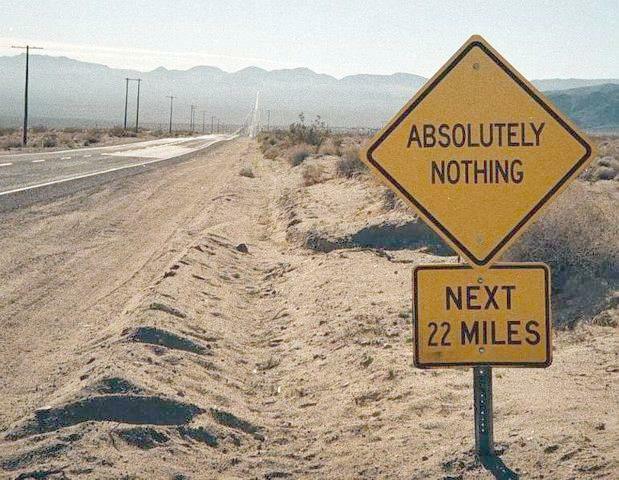 The only thing that Absolutely Nothing does is its greatest asset. It doesn’t lull you into a false sense of security, it doesn’t eat you out of house and home, no you see Absolutely Nothing doesn’t need any flashy gimmicks to sell itself, because it is what it says, and it means it too. When exactly was the last time you bought a product that was was 100% authentically what the merchant told you it was? Now for a limited time we here at Whacko Inc. are willing to sell you not one, not two, not three or four, but an entire dozen of Absolutely nothing for the low introductory price that is absolutely impossible to believe. What would you pay for all of this? Well would you pay $29.95? Of course you would but that isn’t the price! How about the paltry sum of $19.95? What about $14.95? No we aren’t here to cheat anyone out of their hard earned money, we are here to sell you 100% pure, pharmaceutical grade of Absolutely Nothing for the fair market value of $0.00* and look at these free gifts that we send along with it! If you respond to this offer in the next 4 minutes and 24 seconds we will throw in a free supply of Imaginary Stuff**, but that’s not all! The first 4 and a half people will also get a year’s supply of Empty Space***! Don’t be afraid to ask about doubling your order, and just pay a separate processing and handling****. You know you want it; you know you gotta have it, so get your Absolutely Nothing today! And I can offer a solar clothes drier for a mere $59.95 plus S&H. It goes well with the Absolutely Nothing offer. Similar conditions apply. A brilliant offer Jeremy, I'll take two. Sounds great, but how much is postage and packaging? I bet it'll cost a bomb to get a package that size sent to the UK.